Vuls is an open-source, agentless vulnerability scanner written in Go. It automates security vulnerability analysis of the software installed on a system, which can be a burdensome task for system administrators to do manually in a production environment. Vuls uses multiple renowned vulnerability databases, such as the National Vulnerability Database (NVD). Light on resources, Vuls has the ability to scan multiple systems at once, and to send reports via email or Slack. It has three scan modes (fast, fast root, and deep), which you can select according to the situation. Vuls is not a broad IT security scanner; for example, it does not monitor network traffic or protect against brute-force login attacks. However, Vuls provides a way of automating vulnerability reporting for Linux packages. When the databases Vuls uses are informed of a fix to certain vulnerabilities, Vuls will also pull this remediation information into its reports. When generating reports, Vuls prioritizes the most urgent vulnerabilities using the established ranking system from the database. In this tutorial, you’ll deploy Vuls to an Ubuntu 18.04 server. This includes building Vuls and its dependencies from source code, configuring scanning and reporting to Slack, and optionally connecting it to target machines to enable remote scanning. In the end, you’ll have an automated vulnerability reporting system in place that alerts you to vulnerabilities eliminating the need for manual checks. A server with at least 2 GB RAM running Ubuntu 18.04 with root access, and a secondary, non-root account. You can set this up by following this initial server setup guide. For this tutorial the non-root user is sammy. (Optional) Multiple servers running (preferably) Ubuntu 18.04 with root access and a secondary, non-root account, if you want to set up Vuls to scan them remotely. In this tutorial, the secondary account is sammy-shark. In this section, you’ll create a folder for storing Vuls data, install the latest version of the Go programming language, and install other packages Vuls and its dependencies require. To download and compile the dependencies, you’ll install git, gcc, make, sqlite, debian-goodies, golang-go, and wget. sqlite is a database system, which you’ll use here for storing vulnerability information. debian-goodies contains the checkrestart utility, which provides information on what packages can and should be restarted at any given moment in time. golang-go is the Go programming language. You have now installed the required packages, including Go. In order to work, Go requires a few environment variables that you’ll set up: GOPATH and PATH. GOPATH specifies the working directory for Go and PATH (which contains directories in which programs are placed) that must be extended to tell the system where to find Go itself. These environment variables need to be set each time the user logs on. To automate this, you will create a new executable file, called go-env.sh, under /etc/profile.d. This will result in the directory executing every time a user logs on. The export command sets the given environment variable to the desired value; here you use it to populate GOPATH and PATH with appropriate values. The source command reloads the given file into the current shell while preserving its state. In this section, you have installed the Go language, set up its environment variables, and installed packages that you’ll require later on. In the next steps, you’ll download and compile the Go programs that Vuls requires. Those programs are go-cve-dictionary and goval-dictionary, which Vuls uses for querying vulnerability databases. In this section, you will download and compile go-cve-dictionary, a Go package that provides access to the NVD (National Vulnerability Database). Then, you will run it and fetch vulnerability data for Vuls to use. The NVD is the US government’s repository of publicly reported cybersecurity vulnerabilities, containing vulnerability IDs (CVE — Common Vulnerabilities and Exposures), summaries, and impact analysis, and is available in a machine-readable format. Go stores packages under $ GOPATH/src/. You can extend this further with the use of subdirectories to note origin. As an example, packages from GitHub, made by the user, example-user would be stored under $ GOPATH/src/github.com/example-user. You’ll first install go-cve-dictionary, made by kotakanbe, by cloning the Go package from GitHub and compiling it afterwards. Setting the permission flags to 700 restricts access to only the owner. This command loops from the year 2002 to the current year (seq 2002 $ (date +"%Y")) and calls go-cve-dictionary fetchnvd to fetch the NVD data for the current (loop) year by passing -years $ i. It then stores this information in a database under /usr/share/vuls-data. Note: This command will take a long time to finish, and will fail if your server has less than 2 GB of RAM. In this step, you have downloaded and installed go-cve-dictionary, and fetched NVD data for Vuls to later use. In the next section, you’ll download and install goval-dictionary and fetch OVAL data for Ubuntu. In this section, you will download and compile goval-dictionary, a Go package that provides access to the OVAL database for Ubuntu. You’ll then run it and fetch vulnerability data for Vuls to use. OVAL stands for Open Vulnerability and Assessment Language, which is an open language used to express checks for determining whether software vulnerabilities exist on a given system. The same author, kotakanbe, writes the goval-dictionary, and you’ll store it next to the previous package. In this step, you have downloaded and installed goval-dictionary, and fetched the OVAL data for Ubuntu 18.x. In the next step, you’ll download and install Vuls. With all of the dependencies installed, now you’ll download and compile Vuls from source code. Afterward, you’ll configure it to scan the local machine. Remember that it may take some time for this command to complete. The first two sections of this configuration (cveDict and ovalDict) point Vuls to the vulnerability databases you created in the last two steps. The next section (servers) marks the start of server-related information. Separate sections will group information about each server. The only server Vuls will scan with this outlined configuration is the local server (localhost). 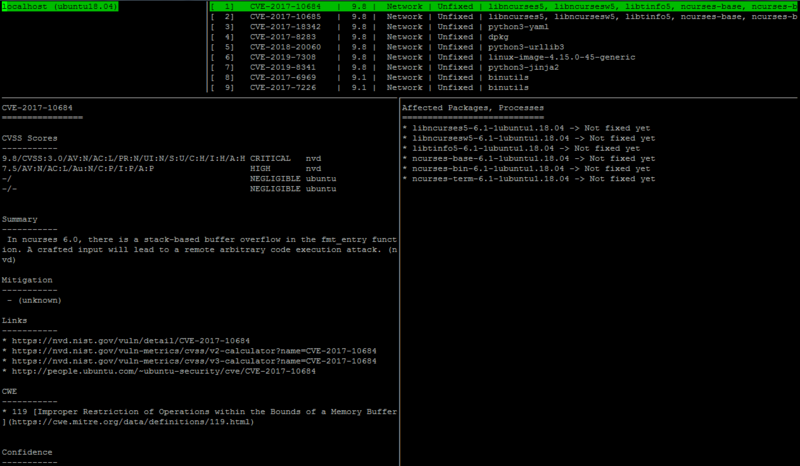 Fast mode (default): scans without root privileges, has no dependencies, and is very light on the target server. Fast root mode: scans with root privileges and can detect upgraded, but not yet restarted processes. Deep scan mode: same as fast root mode, but checks changelogs, which can lead to a high load on the target server. Offline mode: scans the machine without internet access, and can be used in conjunction with other modes. You’ve entered the configuration correctly, and Vuls has detected that it can scan the local server. You’ve installed and configured Vuls to scan the local server. In the next step, you will run a local scan and view the generated report. In this section, you will run a local scan and then view the generated vulnerability report. By now, you have configured only the local server, which Vuls correctly detected in the last step. The default scan mode, if not explicitly specified, is fast. [Feb 27 19:44:12]  INFO [localhost] Start scanning [Feb 27 19:44:12]  INFO [localhost] config: /usr/share/vuls-data/config.toml [Feb 27 19:44:12]  INFO [localhost] Validating config... [Feb 27 19:44:12]  INFO [localhost] Detecting Server/Container OS... [Feb 27 19:44:12]  INFO [localhost] Detecting OS of servers... [Feb 27 19:44:12]  INFO [localhost] (1/1) Detected: localhost: ubuntu 18.04 [Feb 27 19:44:12]  INFO [localhost] Detecting OS of containers... [Feb 27 19:44:12]  INFO [localhost] Checking Scan Modes... [Feb 27 19:44:12]  INFO [localhost] Detecting Platforms... [Feb 27 19:44:12]  INFO [localhost] (1/1) localhost is running on other [Feb 27 19:44:12]  INFO [localhost] Scanning vulnerabilities... [Feb 27 19:44:12]  INFO [localhost] Scanning vulnerable OS packages... [Feb 27 19:44:12]  INFO [localhost] Scanning in fast mode   One Line Summary ================ localhost       ubuntu18.04     539 installed   To view the detail, vuls tui is useful. To send a report, run vuls report -h.
Scanned machines: located on the upper left, lists machines that Vuls scanned. Found vulnerabilities: located right of the machine list, shows the vulnerabilities Vuls found in installed packages. Detailed information: takes up the left part of the screen, shows detailed information about the vulnerability, pulled from the databases. Affected packages: located right of the detailed information, shows what the affected package versions are, and if there is a fixed version. You can cycle the cursor through the panels by pressing ENTER, and navigate with the keyboard arrows. In this step, you have run a local scan and inspected the results. In the next optional section, you’ll configure Vuls to scan multiple target machines. In this section, you’ll configure Vuls to scan multiple target machines. This entails configuring /etc/sudoers on the target and configuring Vuls to scan the target. You can only use a non-root user account on the target server for scanning in fast mode. To enable scanning in fast root and deep modes, you’ll need to edit the /etc/sudoers file on the target machine(s). The sudoers file controls which users can run what commands, and also whether you need a password for specified commands. Since visudo is the utility for defining rules for access and privileged access, you can only run it as root. Because of the importance of sudoers, the file will not exit with errors without giving a warning. This line instructs sudo to allow user sammy-shark to run apt-get update, checkrestart, and every command available from stat, without providing a password. Save and close the file. If you made a syntax error in the process, visudo will inform you and offer to edit it again or exit. Note: By allowing the sammy-shark user in sudoers, you are allowing Vuls to scan using fast root and deep modes. If you want to allow those modes for the local machine (localhost) too, edit sudoers on localhost as shown earlier. That is all you need to do on the target server; you can now log out from the target and log back in to your first server. [servers.target_name] host = "target_ip" port = "22" user = "account_username" keyPath = "account_rsa_key" scanMode = [ "deep" ] # "fast", "fast-root" or "deep"
The lines above serve as a template for adding new servers. Remember to replace target_name with the desired name, target_ip with the IP of the target server, account_username with the username, and account_rsa_key with the path to the RSA key. Vuls does not support SSH password authentication, so specifying a keyPath is necessary. When asked whether you want to continue connecting, enter yes, then log out by pressing CTRL + D.
Setting permissions to 600 ensures that only the owner can read and write the key file. There will be no output from this command. If there are any errors, check your config.toml against the configuration in the tutorial. In this step, you’ve added more target servers to your Vuls configuration, thus marking them for scanning. In the next section, you will configure Vuls to periodically scan and send reports to a configured Slack workspace. In this section, you will configure Vuls to send reports to Slack and make a cron job to run Vuls scans periodically. To use Slack integration, you’ll need to have an incoming webhook on Slack for your workspace. Incoming webhooks are a simple way of an application providing other applications real-time information. In this case, you’ll be configuring the Vuls to report to your Slack channel. If you haven’t ever created a webhook, you’ll first need to create an app for your workspace. To do so, first log in to Slack and navigate to the app creation page. Pick a name that you’ll recognize, select the desired workspace, and click Create App. You’ll be redirected to the settings page for the new app. Click on Incoming Webhooks on the left navigation bar. Enable webhooks by flipping the switch button next to the title Activate Incoming Webhooks. A new section further down the page will be uncovered. 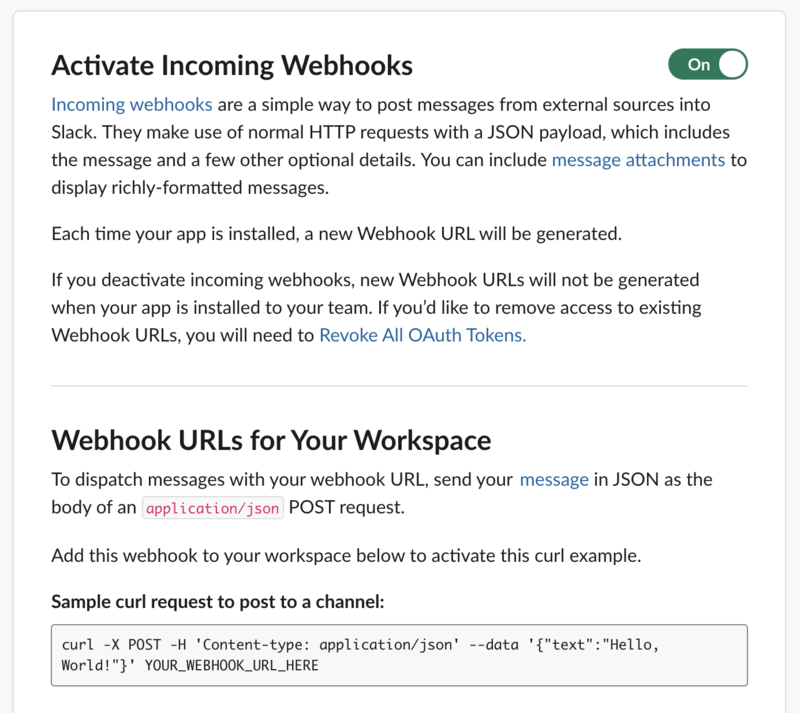 Scroll down and click the Add New Webhook to Workspace button. On the next page, select the channel you want the reports to be sent to and click Authorize. You’ll be redirected back to the settings page for webhooks, and you’ll see a new webhook listed in the table. Click on Copy to copy it to clipboard and make note of it for later use. Replace the your_hook_URL with the webhook URL you noted earlier, your_username with the username of the user that created the web hook, and your_channel_name with the name of the desired channel. Save and close the file. Vuls will take a few moments to run and exit successfully. If it shows an error, check what you’ve entered against the preceding lines. You can check the Slack app and confirm that Vuls has successfully sent the report. Now that you’ve configured reporting, you’ll set up scheduled scans. cron is a time-based job scheduler found on every Ubuntu machine. It is configured via the crontab file that defines in precise syntax when a command should run. To help ease the editing, you’ll use the crontab utility, which opens the current crontab file in an editor. When prompted, select your preferred text editor from the list. The line above instructs cron to run vuls scan and vuls report with the given configuration every day at noon (denoted by 0 0 * * * in cron syntax). In this step, you have connected Vuls to your Slack workspace and configured cron to run a Vuls scan and report every day at noon. You have now successfully set up Vuls with automated scanning and reporting on an Ubuntu 18.04 server. For more reporting options, as well as troubleshooting, visit the Vuls documentation. With Vuls, vulnerability assessment becomes more seamless for production environments. As an alternative to setting up cron, it is also possible to use Vuls in a continuous deployment workflow, as its scans are lightweight and you can run them as needed. You could also consider implementing a firewall with Vuls to restrict access and reduce the need for root access.